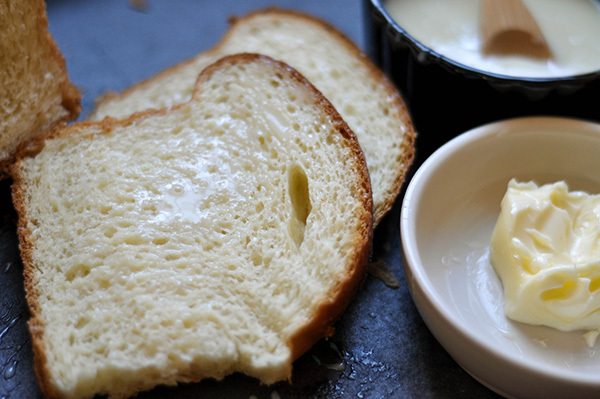 Hokkiado Milk Bread is not your typical white bread. It's slightly sweet with a tender crumb and milky aroma. It's the bread you find in most asian bakeries. We eat it for breakfast, in the afternoon with our milk tea and use it for our sandwiches. It's delicious and versatile and once you try it, white bread just won't do. This stuff is so good, my uncle buys three loaves a week! But I say, why buy it, when you can make it at home, fresh! Now, I'm not a patient person. Waiting is my number one pet peeve. But unfortunately in NYC, you have to wait for everything, from the bus, to lines for food, for tickets, in traffic, there are even lines to get into a store! I mean why am I waiting on line to spend money!? It drives me crazy. But there is one thing I will wait for...bread. Good warm, soft straight out of the oven, homemade bread. And this Hokkaido Milk Bread doesn't disappoint. It has a soft fluffy crumb with an airy texture. My parents have no idea why I'm so willing to spend the time to make this when I can go to the bakery and buy one for 3 bucks. But you just can't replicate the smell of fresh bread baking in your oven. It fills your house with a warmth and makes my family gather around my tiny island for their first slice slathered with jam or condensed milk. It's not just bread, its happiness. So when I got a new Kitchenaid professional mixer for mother's day...I had to test it out on some bread dough. My old mixer would groan and shake whenever I used it to knead dough. I probably burnt out the motor. But it looked like it was going to leap off my counter. So a new mixer equals way more bread! I found this recipe in the New York Times. Not where I thought I would find a milk bread recipe, but I've used it so many times over the years and it comes out perfect everytime. Most Asian bread recipes start with a cooked starter called a tangzhong. It's made with milk, water and bread flour cooked to a gluey consistency. This is what gives the bread its soft texture. Mix the dry ingredients, add the wet including the starter and knead for 8-10 minutes. The dough will go from a wet dough that sticks to the bottom of the bowl to a soft, slightly tacky dough and pulls away from the sides of the bowl. Thats when you know its ready for its first rise. And there's nothing more fulfilling that watching bread dough rise. I love seeing it breath and expand. It just gives me a sense of accomplishment. After the first rise you punch down the down and roll it into 4 balls. Let this rest for 15 minutes, Then its time to shape. Roll each ball into an oval about 12 inches long. Fold the top and button of the dough to the center, then take the dough from one sides and roll to the other. Place this log into one side of your buttered loaf pan. Do the same with the rest of the balls so you end up having rolls on each end of your pans. Let this rise for 60 minutes till the dough peaks out from the top of the pans. I love how pillowy it gets. Makes me want to rest my head on it! Brush the tops with milk and bake for 35-40 minutes. The milk turns the tops of the bread a beautiful golden brown in the oven. Allow the baked bread to cool for 1 hour on a wire rack. I know its a long time, but this keeps the fluffy texture in tact. And boy is it worth it. Once that excruciating hour is up, slice and enjoy with butter, jam, condensed milk or Nutella (which is what I'm doing as I type this) Totally worth the time. Add egg, milk and the starter. Turn the mixer on low speed and knead 5 minutes. Add the butter one piece at a time and knead for another 10 to 12 minutes until the dough is smooth and springy and just a bit tacky. Punch the dough down and use your hands to scoop it out onto a surface. You won't need much bench flour at all, the dough is quite easy to handle. Using a bench scraper, cut dough into four equal portions. Form the dough into balls, cover again and let rise 15 minutes. Lightly flour your bench, and with a rolling pin, gently roll out each ball into a thick oval about 12 inches long and 6 inches across. Fold the top 3 inches of the oval down, then fold the bottom 3 inches of the oval up, meeting in the middle and making a rough square. Starting from the right edge of the square, roll up the dough into a fat log, pick it up and place the log in the buttered pan, seam side down and crosswise, nestling it near one end of the pan. Repeat with the other dough ball, placing it near the other end of the pan. Cover and let rise for 60 minutes, until the risen dough is peeking over the edge of the pan and the dough logs are meeting in the center. Pre heat the oven to 350F. Brush the tops with milk and bake on the bottom shelf of the oven until golden brown and puffed, 35 to 40 minutes. Enjoy with condensed milk, butter or jam!